To add perfectly to October’s spooky season, York County Teen Science Café welcomed Mr. Brewer to talk about “putting people under”. Mr. Brewer did an amazing job explaining his job as the Chief Anesthesiologist assistant at Piedmont Medical Center. 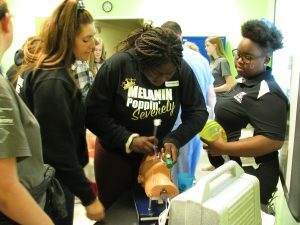 He explained the difference between different types of anesthesiologists, career paths, and opportunities to get in the practice of anesthesiology. 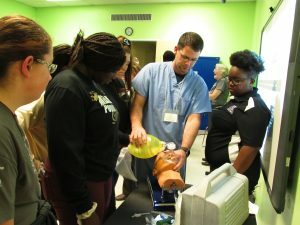 Teens were interested in the changes in anesthesiology drugs and how drugs used during surgery can affect the patient. Research in this field is becoming a focus as surgery is changing and new techniques will be needed to keep patients comfortable and safe. In one part of the presentation, students eagerly watched as Mr. Brewer demonstrated how to insert and administer anesthesia gas through the esophagus and trachea. Mr. Brewer used a tool called a laryngoscope to press back the tongue and epiglottis of the mannequin, in order to open the trachea. After the trachea was open, Mr. Brewer used the laryngoscope as a guide to insert an endotracheal tube. The endotracheal tube would then be used for administering anesthesia for surgery, breathing tubes, or other medical purposes. In addition to a live demonstration, Mr. Brewer also passed around real anesthesia breathing masks that are used in hospitals. They were almost as fun as mini beach balls! At the end of Mr. Brewer’s presentation teens were allowed to practice inserting the laryngoscope into the mannequin or ask Mr. Brewer any questions about Anesthesiology.